On the first day of trials in March 1932, trolley bus 216, the 'Green Goddess' is being examined by a number of onlookers before commencing a run along Lower North East Road. Photo: MTT. Although other Cities around the world had been experimenting with and later installing permanent trolley bus systems since just prior to the First World War, Australia didn't try the system until the early 1930s. In March 1932, the first trolley bus in Australia commenced running on trial between Payneham and Pardise. The outer section of the tramway to Paradise mostly ran through a lightly developed area and between peak periods, the passenger traffic offering was fairly small which made the location the most suitable for trial since the electrical equipment needed to run the trams was already in place to power the trolley bus. To run the service, a 'Garfield' petrol bus was converted to electric operation and was soon known as the 'Green Goddess'. Trams continued to provide peak hour services. The trial was a success and in May 1932, passengers were carried on the new trolley bus for the first time. 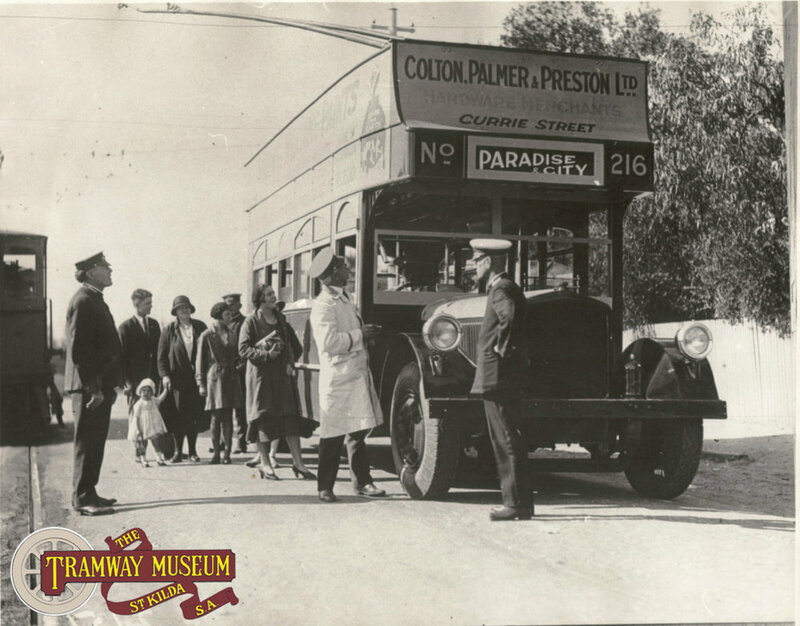 Although it meant all passengers had to transfer to a tram at Payneham for the rest of the journey to the City, the Paradise trolley bus continued to operate until August 1934 by which time more permanent trolley bus routes were being prepared. Tram services were then resumed in full to Paradise. Seen only a few months after the start of permanent trolley bus services to Tusmore, double deck trolley bus 421 is seen at the terminus before commencing a run to the City in 1938. Photo: MTT. Following the success of the trial service from Payneham to Paradise, the Municipal Tramways Trust planned ahead for the first permanent trolley bus line. It was decided to convert the motor bus route from the City to the south eastern suburb of Tusmore for this new service. This first route was to be the start of a major trolley bus system in Adelaide which would ultimately grow to be one of the largest in Australia. Opened in September 1937, the new service commenced from Light Square in the City and ran via Hindley Street, Rundle Street, Dequetteville Terrace, Victoria Avenue (now Fullarton Road), Grant Avenue, Portrush Road, Stirling Street, Northumberland Street, Greenhill Road and Tusmore Road before terminating at the intersection of Deveraux Road. Because the suburbs this route passed through were some of the wealthiest in Adelaide, the new overhead support poles on the sides of the road were painted green to blend in with the surrounding trees! As well as that, every bus was issued with a dust pan and broom with which the conductor was expected to use at each termini. In the early 1950s, the development of the Adelaide trolley bus system continued after several of the former tramways in the Burnside area were converted. As well as these conversions, the Tusmore service was extended to serve Beaumont. From the former terminus, the wires were erected along the the length of Deveraux Road to terminate at the intersection with West Terrace in Beaumont with the new service commencing operation in January 1952. Like the other trolley bus lines in the south eastern suburbs, the extension to Beaumont would only have a short life of 11 years with closure coming in July 1963. 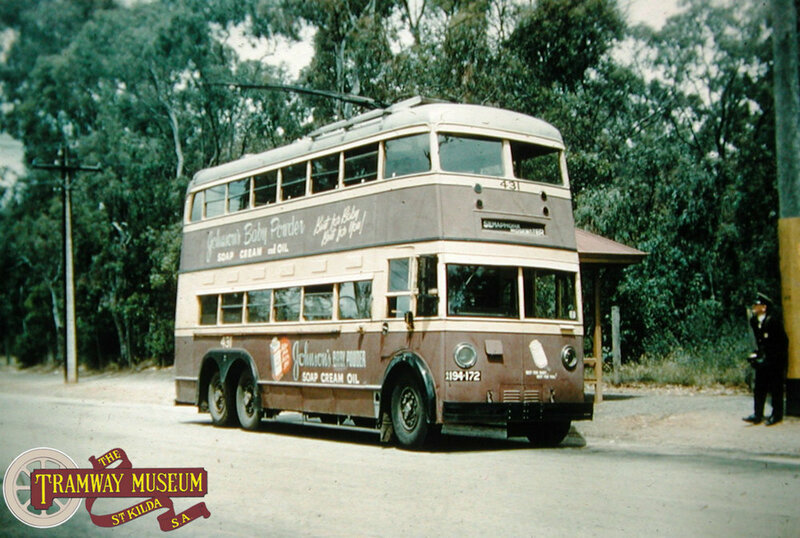 In April 1961, a special tour of the trolley bus system was held by the AETA with a trip to Semaphore being part of the trip. Seen here at the Semaphore terminus is the tour bus with a 'Redhen' suburban railcar set seen in the background. Photo: John Radcliffe. The next route expansion was also the largest in Adelaide with the trolley bus network being expanded all the way from the City to Port Adelaide, Semaphore and Largs. The electrical supply equipment and depot facilities from the recently closed Port Adelaide tram system was used in development of the trolley bus system to this part of Adelaide. 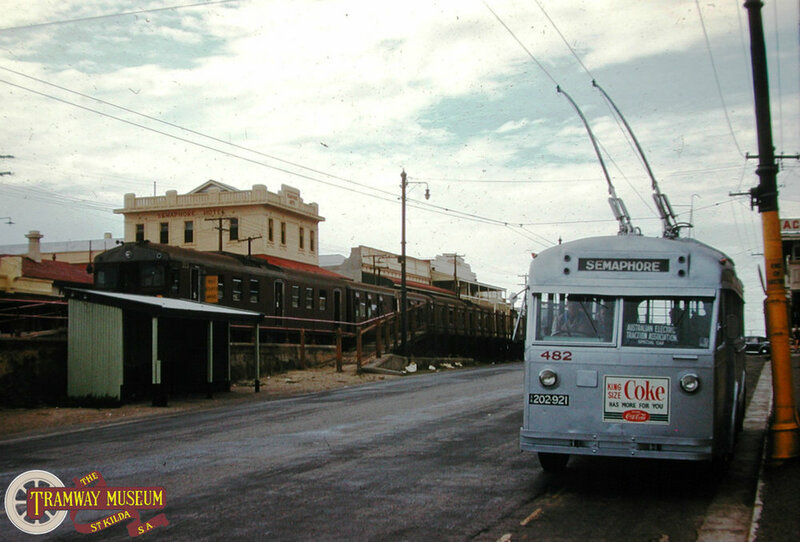 Opened in 1938, the service was operated as an extension of the Tusmore service and the route started in Light Square before running Hindley Street, West Terrace, Port Road and Commercial Road before the Port Adelaide services arrived at the very end of Commercial Road. For the services that continued to Semaphore, trolley buses turned left from Commercial Road on to St Vincent Street and continued along Hart Street before turning north in Military Road and then finally Semaphore Road before terminating at the Esplanade. Services for Largs turned off the Semaphore route at the intersection of Hart Street and Ring Street, proceeding up Ring Street, Woolnough Road and Military Road before turning in to Jetty Road, Largs and terminating next to the Largs Hotel. After this major expansion, the trolley bus system remained the same until the immediate Post War period. From the opening in 1938 until 1960, the Semaphore and Largs services had crossed the Port River on the old Jervois Swing Bridge. The ageing structure (which dated to the late 1870s) was replaced by a new fixed road bridge in the 1960s but in the interim, trolley bus services were instead diverted to cross the Port River at the Birkenhead Bridge which has twin opening bascule spans. This caused a number of headaches when it came to erecting the trolley bus overhead wiring across the bridge which had to have connections over the bridge joint as well as the wiring dropping to near road level when the bridge was raised. Once having crossed the bridge, services turned left in to Semaphore Road before the Semaphore buses turned in to Port Bridge Road before rejoining the old route in Hart Street. Largs services continued along Semaphore Road before turning on the old route alignment in Military Road. Like all the other trolley bus services, the last buses ran in July 1963, the latter day route revisions in the Port area only lasting for three years. One of the Post War trolley buses, 510 is seen at the terminus of the Linden Park service before rounding the turning loop and heading back to the City in March, 1963. Photo: Michael Church. The first extension to the trolley bus system since before the Second World War occured in 1952 when the former Linden Park tram line was converted and opened in October 1952. The conversion work taking only five months to complete. The original tram route was followed in it's entirety but the service was extended further south down Portrush Road to terminate at Brae Road. Although the tram service had been closed in May 1952, trolley buses ran over the disused tracks until April the following year when contractors started to remove the track from the road surface. The opening of the Linden Park trolley bus service was not without incident. The first public service had been given the authority to depart from the new terminus by the Mayoress of Burnside and as the bus was heading north on Portrush Road, a car from a side street appeared at the last minute resulting in heavy braking and swerving of the trolley bus. By the time the vehicle had come to a stop, a lot of passengers had found themselves on the floor and some of the overhead wiring had also been torn down! Despite this initial hiccup, services on the new extension were successful. Ultimately the Linden Park service went the same way as the other trolley bus lines and had been closed by 1963 in favour of an all diesel bus fleet. Five of the double deck trolley bus fleet were three axle units (the rest only had two axles). One of these buses is seen at the former tramway terminus at Erindale before returning to the City in November 1955. Photo: Keith Kings. Like the conversion of the service to Linden Park, the Burnside and Erindale tramways were also converted to trolley bus operation. After the previous incident at the public ceremony opening the Linden Park service, the final two trolley bus lines in Adelaide were opened without ceremony in May 1953. A new turning loop was put in at Marryatville but apart from that, the new services followed the original tram routes. This extension would prove to be the final extension of not only the trolley bus system but of electrically powered transport in Adelaide of any form until the 2007 extension of the Glenelg line to City West. After this point, the services run by the Municipal Tramways Trust would be primarily be provided by diesel buses. Services on the Burnside and Erindale trolley bus routes ceased at the same time as the other trolley bus routes in July 1963.